Today I’m singing the I’m lucky lucky song (and doing the dance). I’ve had some amazing trades in the past and here’s another one. I’ve long admired Jess Hutch‘s amazingly cool, soft, fuzzy knit robots and I swooned over her adorable bug for month of softies. So when I recently discovered her flickr account I added her as a contact right away. That’s where I spotted the photo she posted of her latest little guy. I freaked out! I loved everything about him so much. So I worked up some courage and begged a trade. 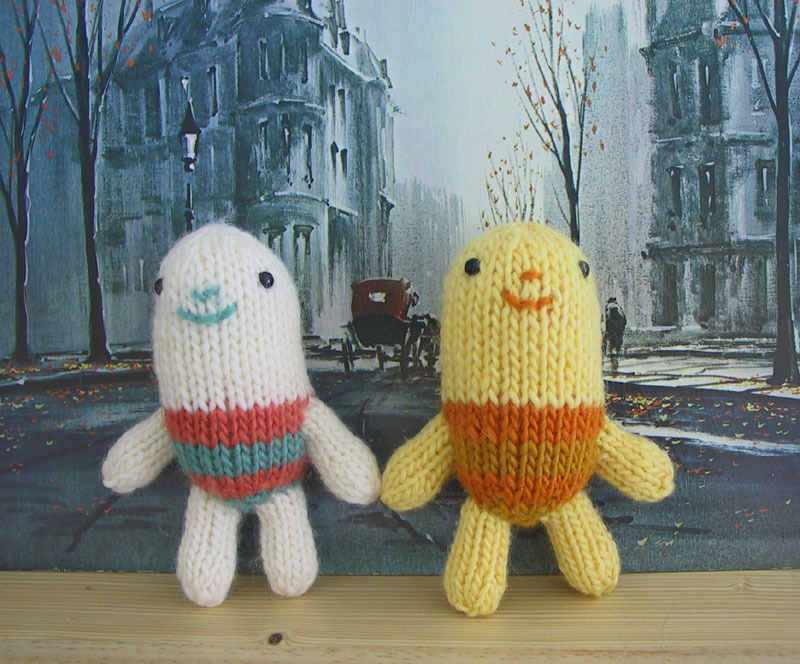 Jess graciously agreed and I sent her Miss Lilian Bunny and she sent me not only odd fellow, but his pal odd fellow 2. Two! 2! They’re amazing. The knitter in me is so humbled in their presence. They’re beautifully made and their little faces are perfect. We’ve all become fast friends and I’ve agreed to take them on many adventures. Here they are visiting the 1880s (via the awesome fake oil painting thrift score from last week). I’m jealous. I saw this little guy too, and now he has a buddy!. ouch. I love them especialy because they look like maybe at some point they had a hairstyle, and then went bald. wow, you really are lucky! you know, it just goes to show that you never can get what you want if you don’t ask. 🙂 brave you for asking. i haven’t been brave enough to ask for swaps (but then i don’t have anything swap worthy). Wow! Time travel. I bet they never expected that. I’m glad you liked them and I’m glad we did a trade! Nice odd fellows! 😉 But Miss Lilian Bunny is worth them, I think. Very cute swappy goodness – how fun! i could eat them, too cute.